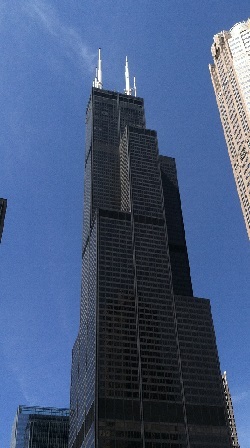 Discount Willis Tower Skydeck Chicago tickets. Guide to Willis Tower. To keep up with the latest news on deals, discounts and free events in Chicago, sign up for the daily Chicago on the Cheap newsletter. You can also follow us on Facebook and on Twitter. Getting up to the top of the iconic Willis Tower Skydeck isn’t cheap. It’s usually $23. Where: Skydeck Chicago, Willis Tower, 233 S. Wacker Dr. Hours Skydeck entrance is located on Franklin Street (east side of the building). Soar to the top of one of America’s tallest buildings and see Chicago from 103 stories above street level with this offer that saves over 20% on admission. The Skydeck is open 365 days a year: April-September from 9 a.m. – 10 p.m. and October-March from 10 a.m. – 8 p.m.